May 14, 2016 | ProgressTH Solar power systems allow electricity to be produced virtually anywhere the sun’s rays reach whether it is in space or in a remote island village otherwise disconnected from national power grids. With costs dropping and the capability of these systems rising, along with an ever growing community of people able to design and set up solar powered systems, it can reach out and light up places technically, economically, and even politically where other sources of power cannot. A remote village on the Thai island of Phuket has been in energy limbo for quite some time. The villagers are from a tribe and live on land that is in legal dispute. Because of this, setting up power through the national grid is problematic. 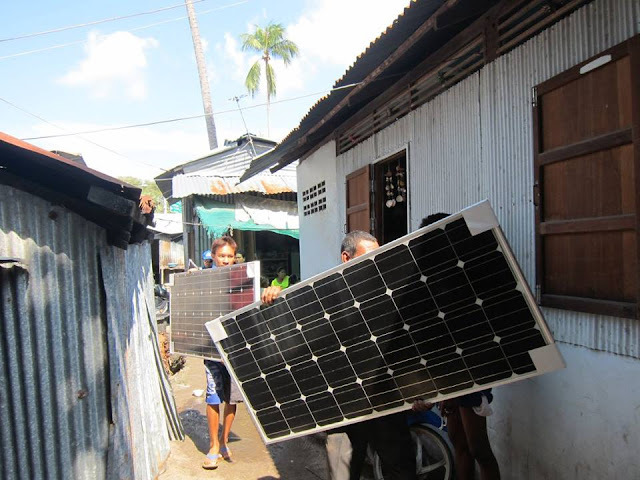 However, solar power allows the villagers to produce and use electricity on site without access to the national power grid, allowing them to power their homes until the dispute is settled. Something like a light and a fan may seem simple to most, but for people living in a tropical country, a simple electrical fan can make all the difference between just surviving and being comfortable. 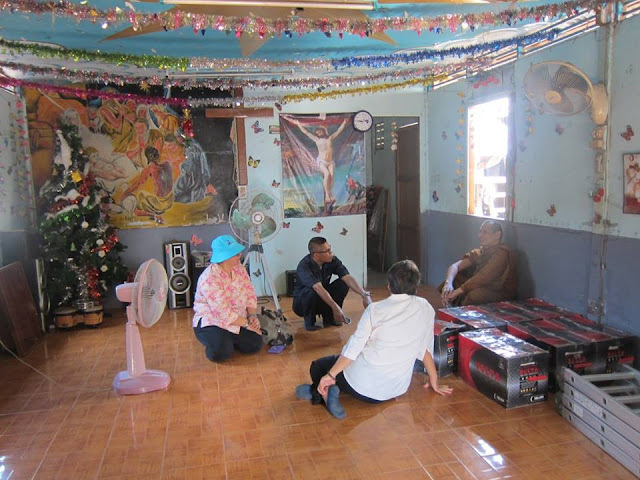 Coming from halfway across the country, Prakruwimolpanyakhun (Monk-Teacher Wimolpanyakhun) also known as “the Solar Monk,” and head of the Sisaengtham School (Facebook here) in northeast Thailand, was able to raise funds and find volunteers to bring electricity to this village. Inside the church whose roof now is covered in solar panels, Prakruwimolpanyakhun sits against the wall beside the batteries that will soon be storing and distributing energy for the village. When real solutions are involved, different ideologies can easily cooperate and overcome challenges. 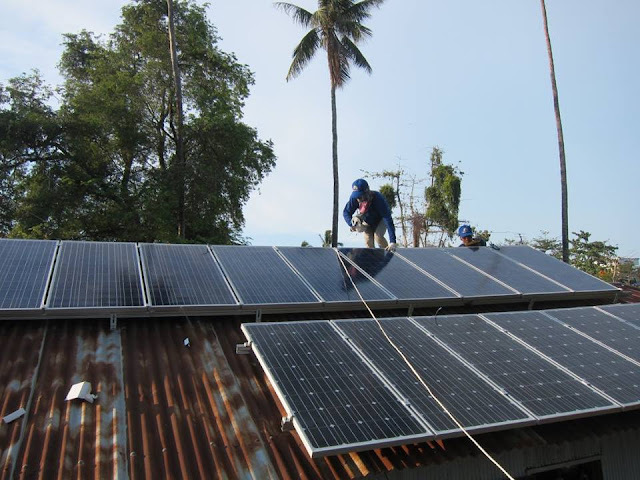 Having much experience in setting up and maintaining solar powered systems, the Solar Monk was able to quickly organize and “turn on the lights” and get spinning the electric fans. The solar panels for the village needed to go atop a sturdy roof. The only roof strong enough was the village’s church. It was a poignant image to see a Buddhist monk flanked by volunteers working in a Christian church to help improve their situation and speaks well to concept of improving society not by clashing together with ideologies, but building together with pragmatic solutions. Twenty-five homes in all were given basic lighting and electricity for electric fans. With the system in place and locals taught how to install and maintain their power network, improving it and expanding it is now a possibility. Solar technology is particularly useful for bringing power to remote areas, either forgotten villages or new villages and facilities where connecting to national grids may be difficult, expensive, or impossible. Solar power is relatively cheap to set up for very basic applications, and is modular with expansion possible given the right amount of resources to acquire extra equipment. It need not be a case of poverty or incomplete infrastructure. Farms that stretch out over large areas and require electricity are solving this by using distributed, independent solar power systems to generate electricity to operate various aspects of increasingly technological agricultural activities. Everything from sensors and solenoids, to water pumps and timers are making use of solar power because of the ease of setting it up in remote areas versus extending power lines out to where electricity is needed. Set ups like this are becoming increasingly common across rural farming communities to use solar power and cheap electronics to automate irrigation and organic fertilizer distribution. Sensors and Internet connectivity will make these systems even "smarter" and more efficient. Improvements in battery technology and energy management, along with trends in overall dropping costs for panels, batteries, and the electronics to control both will make the use of solar power even more attractive for a growing number of applications. What will the future look like? It is hard to tell, but for the villagers on Phuket, it is already a little brighter today than it was yesterday.